A colourful wedding arch serves as the ideal focal point for brides and grooms saying their ‘I do’s’ on the beach. 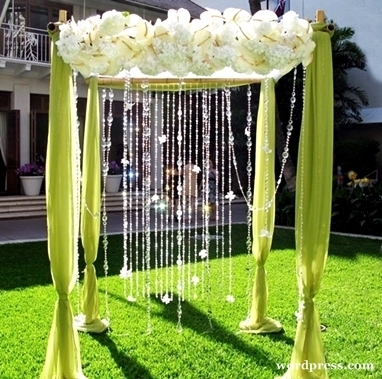 To some people, a wedding arch is nothing more than something pretty to look at during a wedding ceremony. However, intricately decorated archways can also become a major highlight of your wedding décor – particularly for couples saying their vows on the beach in Thailand. Elegant wedding arches make a great frame for photographs, and set off the stunning sea views behind them. With the right choice of flowers, they can also provide a delicious tropical scent to complement the refreshing sea breeze. Because they are usually used at the beginning of the wedding celebration, they also offer an exciting sneak peek of the décor theme that is to follow. 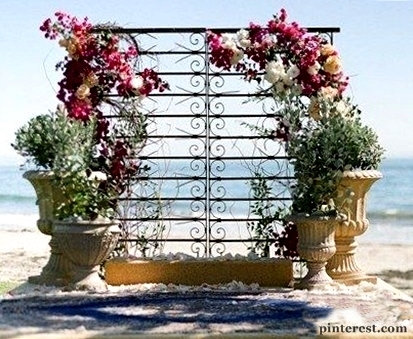 An unconventional arch can use large potted plants and sprawling flowers to create more of a sculptural focal point for a beach wedding. Elegant stone or clay pots may create a little more work to heave around, but they are more than worth it for couples that want to introduce a classic, traditional feel to their beach wedding. Potted plants, like roses, work well in a more traditional setting, and their hardy nature means they are likely to withstand the strong sea breeze and refreshing ocean spray a little better than other, more delicate blooms. A sparkly arch is the perfect fit for brides and grooms that don’t want to go too floral with their decorations. Elegant chains of crystal can be hung with ease to softly shimmer in the romantic evening light of your wedding ceremony. Due to the delicate nature of these hanging crystal chains, this type of decoration might work better for couples tying the knot in the lavish greenery of their villa’s private garden as opposed to a few metres from the sea surf. If you are tying the knot in a tropical location, it seems sensible to make the most of the wealth of materials at hand. 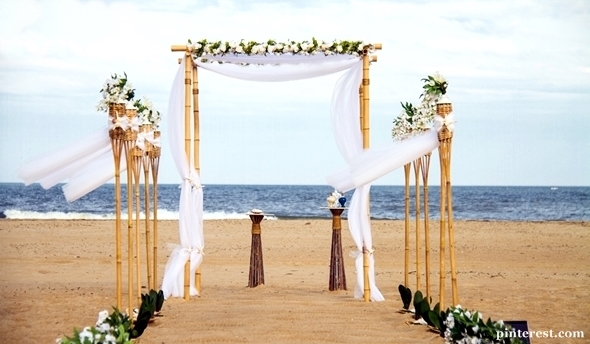 To make your wedding arch a tropical masterpiece, why not have one that is constructed of bamboo sticks as opposed to metal or wood? Using a natural material like bamboo is also great for couples that want to get creative in the design and shape of their wedding arch. Not only is bamboo strong enough to withstand a fresh sea breeze, but it can also be decorated with a range of tropical flowers. 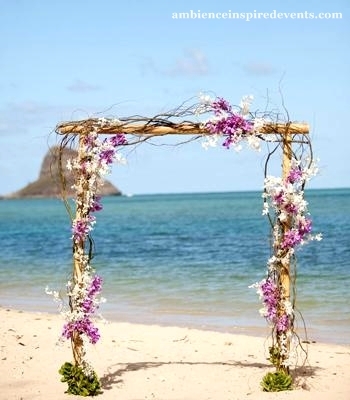 Why not scatter a tie some frangipani flowers to your bamboo arch to add a splash of tropical pink, white and yellow? When in Thailand, why not do as the Thais do? If you want to give your wedding ceremony a traditional Thai twist, you can use the very same delicate jasmine wreaths to decorate your wedding arch as are traditionally used for all Thai celebrations. 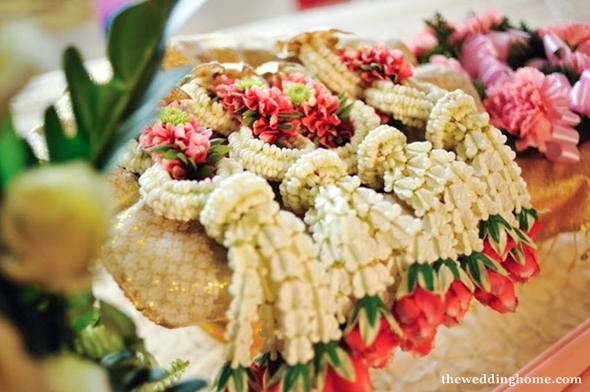 Jasmine wreaths hold a special place in Thai culture, particularly on family occasions when they are often given as gifts. These delicate white blooms can easily be attached to your flower arch, and their soft colour means it is easy to incorporate other tropical flowers into the arrangement. What's more, the scent of fresh jasmine will perfume your wedding ceremony beautifully. There are few flowers that say "Thailand" like an orchid can. The Kingdom is home to an impressive array of orchids that grow in the wild, so it is not difficult to get your hands on a variety that suits your wedding colour theme. Against the turquoise blue background off the ocean, orchids in the warm pink and orange hues of sunset always work well. Incorporated some white hanging muslin fabric into your elaborate orchid arch will also offer the bride and groom some protection from the sun as they say their vows.